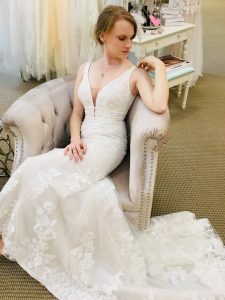 Diane D’Anglo, the internationally known bridal gown and accessories designer from Southern California, sat down with us recently to discuss her extraordinary role in the wedding industry. 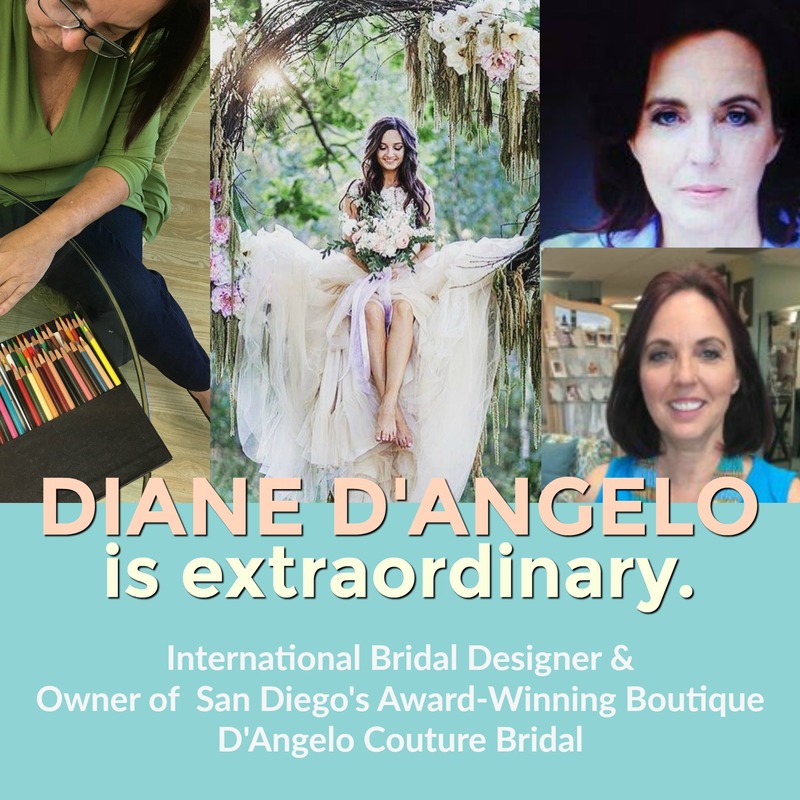 Diane creates some of the most amazing wedding dresses and accessories sold in fine salons in the US and Canada, but she ALSO finds time to operate her very own bridal boutique in San Diego: D’Angelo Couture Bridal. Diane puts her passion for the industry and her years of design experience to good use with her local brides. 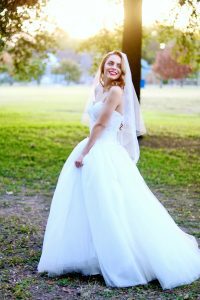 Because she is also a talented designer and dressmaker, she is able to easily translate each bride’s unique vision into a completely custom wedding gown, or she can customize any part of one of her stock gowns. 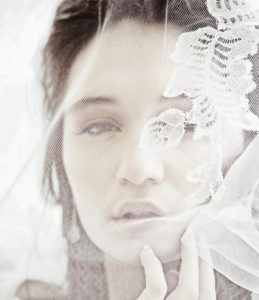 Diane designs because she believes that happy and comfortable brides are the most beautiful brides. And her brides look very happy and comfy!!! Diane D’Angelo’s love for design began while she was still attending high school. Not satisfied with off the rack styles available to her, she designed and made her own clothing. Her interest in design grew as she gained experience. 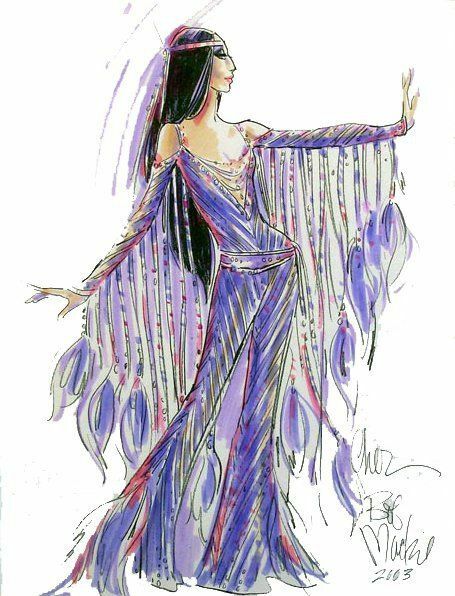 She really loved the elaborate costumes of Bob Mackie, who dressed Cher among many other celebrities. Diane began drawing dresses inspired by his style, but for brides instead of entertainers. It wasn’t anything like the bridal styles popular in the day, but Diane, like most creators, thought outside of the box. Her extraordinary passion for designing unique dresses was born. 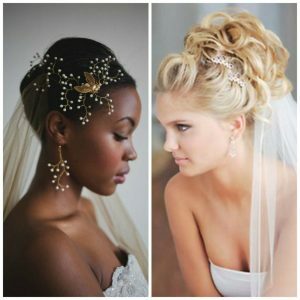 Diane began making her own bridal gowns and gradually expanded her line to bridal jewelry and accessories. 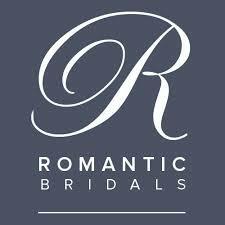 Dresses, Bridal Belts, Earrings, Veils, Necklaces and Tiaras are all part of her lovely, successful bridal line today. But Diane is able to also run her own bridal boutique which allows her unique access as to what today’s bride is looking for. Diane and her staff are truly in business to help their brides. Diane provides a one-on-one experience for her brides and encourages them to relax and share their thoughts. She absolutely loves working with her brides, learning what styles they want and hearing their love stories. 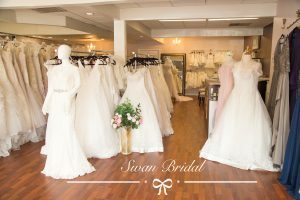 It is her favorite part about owning a bridal boutique! Her life has been enriched by sharing the wedding dress experience with each of her brides. And, even though owning a wedding store is a time-consuming endeavor, Diane remains inspired on a daily basis. Since she has been designing for more than thirty years, she views each day as a new design day and that fuels her creative passion. 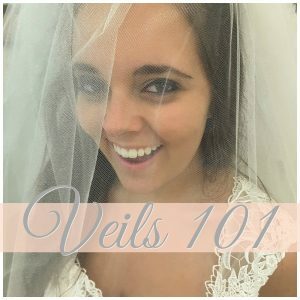 Her boutique benefits from her years of being of service in the wedding industry. The future looks bright for Diane who continues to win awards for her designs AND her bridal store. She plans to include even more of her own designs in her boutique since they are what the brides are asking for. In the coming months Diane predicts that style trends will shift to even more comfortable dresses. She will be adding more designs with straps and sleeves and use fabrics that stretch and conform to the body. For more information on D’Angelo Couture Bridal, click here.